(This past Saturday sold out. It will CLOSE in one & a half weeks. We recommend getting tickets NOW. Check out ChiIL Mama's original video interview with Mark "Mucca Pazza" Messing, who wrote the amazing score. We caught up with Mark (and Oscar nominee, Brian Selznick) on the set of Houdini Box, now playing with Chicago Children's Theater. Mark expounded on the creative process and how he wrote the scores for both shows simultaneously. We'll have that up in the very very near future, so check back with ChiIL Mama like we vote in Chi, IL...early and often. Photo by Jim Newberry, mask by Richard Henzel. Here at ChiIL Mama/ChiIL Live Shows, we had a chance to catch Hunchback Variations opening night and we were blown away by the show. Highly recommended! Buzz in the lobby had other local playwrights and actors excitedly exclaiming it was one of their favorite, top 10 shows of all times, amazing and well executed. Others were moved to tears. At the after party, I spent hours with Oobleck regulars who had seen the show numerous times as a spoken piece, over the years, and who were astonished at how well the music upped the ante. "I'm so glad I saw this opening night so I have the maximum possible time to spread the word." "If you don't like this play, I'm sorry. You can't be my friend anymore. There are some plays and film that are like my soul poured out on the page and this is one of them. If you don't get it, you don't get me." "This could have so easily been a cheesy, over the top, parody. I mean, come on....really. Yeah, do you want to give us a grant to write an opera staring two deaf guys--Quasimodo and Beethoven, and an impossible sound from Cherry Orchard? But it's not. They took the piece very seriously and created something stunningly beautiful." 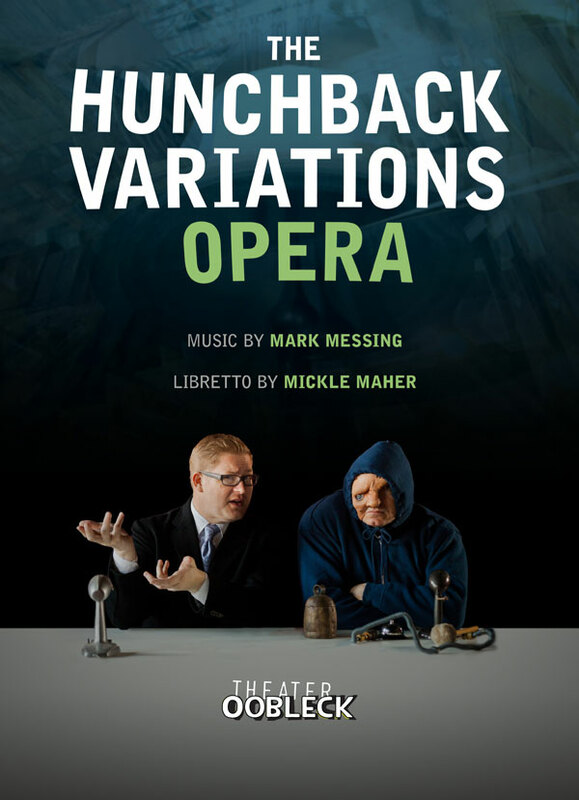 Hunchback Variations is truly a masterpiece that's been percolating for the 23 years of Oobleck's existance, waiting to see the light of day. It's quirky and deep, hilarious and moving. Oobleck has managed to create a multilayered piece where the instruments converse as surely as the main characters. I love the delicious irony of such a successful collaboration themed on a failed collaboration! There are sweet, absurdest moments, and witty word play. Hunchback Variations ultimately becomes an ode to that illusive beast...creative process. I loved the mucking through the swamp imagery. I studied Chekhov's Cherry Orchard in college theatre, and I'm betting he would have enjoyed the angst and frustrating futility caused by his final play's unreproducible sound. This piece is right on so many levels; intellectual without being intimidating. Psychologically and cognitively the show is best suited for adults and teens at the youngest. Though there is nothing objectionable if you're considering bringing the family. There were a few tweens there on opening night, and I've been considering bringing my 10 year old son back to see it again. Kids who are creative word and/or theatre geeks, or musically inclined are likely to enjoy The Hunchback Variations. "“The singing is beautiful. George Andrew Wolff’s bright tenor contrasts effectively with Larry Adams’s round, chesty bass, and both singers have first-rate diction so the text is always clear. The counterpoint between Wolff’s cheerful, well-groomed Beethoven and Adams’s morose, grotesque Quasimodo is mirrored by the bold give-and-take of pianist Tim Lenihan and cellist Paul Ghica..."
WBEZ "Pick of the Week"
--Jonathan Abarbanel, WBEZ's "Dueling Critics"
or by calling the Victory Gardens box office at 773-871-3000. That’s right. It’s happening. Theater Oobleck is doing its first opera. “Cerebral, comic, and just plain weird,” St. Louis Post-Dispatch, 2002) Mickle Maher‘s The Hunchback Variations (2001) has been one of the most successful productions in Oobleck’s 23-year history—presented to critical acclaim over the last decade in Chicago, St. Louis, Washington D.C., and Hamburg, Germany. The Hunchback Variations takes the form of a panel discussion between Quasimodo, hunchback of Notre Dame, and Ludwig van Beethoven, composer, on their attempt to create a mysterious sound effect called for in Anton Chekhov’s The Cherry Orchard. Playing out over 11 scenes, or “variations,” the story details the duo’s collaboration—one doomed by their mutual deafness, their unpleasant working conditions, and the fact that Beethoven has not yet finished reading the The Cherry Orchard. A deft deconstruction of the creative process, and a fearless investigation of artistic collaboration, Hunchback is driven by questions about the nature of music and sound and performance. So, what could be more natural than to throw it fully – collaboratively!—into the embrace of music and sound and performance by giving it over to the wildly innovative mind of composer Mark Messing, the genius behind the scores of numerous Redmoon productions, and co-founder of the mad, brilliant marching band, Mucca Pazza? With George Andrew Wolff (tenor) as Beethoven, Larry Adams (bass) as Quasimodo, Tim Lenihan on piano, and Paul Ghica on cello. Lighting design by Chris Wooten. Stage Management by Melinda Evans. Graphic design by Colm O’Reilly. Photography by Jim Newberry. You can find Oobleck on Facebook, on Twitter, and on their Web Site.